On July 6, 2013 Mr. Goldberg’s rank placed him close to or in the top 10% of all authors who have sold books on Amazon. Building a Successful Business - This book covers topics ranging from business plans to strategic planning to marketing and branding to customer service management to sales skills and elevator pitches to cash flow management and more. The book is the entrepreneur’s business plan and management skill instruction manual, tip sheet and workbook. The book is used as a text book in numerous entrepreneurship courses and has been endorsed by individuals in not for profit, government, education and bank management. The book also received a five star review from the Midwest Book Review. How to Get, Keep and Be Well Paid in a Job – This book was written for individuals to read to help in the job search and to understand the workplace skills and behaviors that employers expect all employees to possess if they want to keep and progress in their jobs. The book not only explains what is expected, but why employers value those skills. It also uses real life examples outside of the workplace to help illustrate key concepts. The book received a five star review from the Midwest Book Review and is ideal for individuals going into the workplace for the first time, or for individuals who find themselves bouncing from job to job instead of staying with and seeing their compensation grow with one employer. Workplace Basics, Workplace Skills, People Skills, Customer Service – This four book series was developed to use as textbooks for on-the-job or classroom work readiness and customer service training. While working for a client, Jay Goldberg developed a work readiness and customer service training program that was called the best work readiness certification program in the United States by a member of the National Skills Standard Board at a presentation of the Program in Jacksonville Florida in January of 2003. These books update and improve upon that program. Mr. Goldberg is also a former Service Director (Vice President position) for Citibank so he brought a lot of expertise to his Customer Service book. Currently, Mr. Goldberg is working on a comprehensive work readiness and customer service book that can be used by venues looking to install a formal course. The book will include not only lecture content; but in-class exercises, role plays, competency statements, final workplace scenarios that can be used as certification tests and more. There will be two versions of this book; one with and one without the answers to the in-class exercises. The final two books that Jay Goldberg has available on Amazon are football books. Mr. Goldberg has been the lead analyst for 900 Football Links since 2000. The first book was an NFL Preview for the 2012 season. The second, 2013 Pro Football Draft Recap and Fantasy Football and Season Preview has many more features than the 2012 edition. 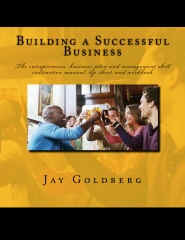 To get more information about Jay Goldberg’s books, visit his Amazon author page at http://www.amazon.com/Jay-Goldberg/e/B0083056QW.